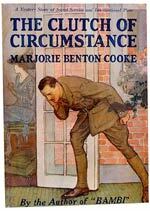 Marjorie Benton Cooke, The Clutch of Circumstance. Sax Rohmer, The Green Eyes of Bâst. [London: Cassell, 1920?] Artist: McKenna? Mrs Belloc Lowndes, The Lonely House. Peter B. Kyne, Webster - Man's Man.